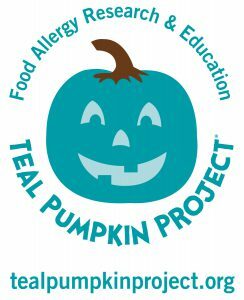 For Food Allergies, a Halloween Appeal: Go Teal! From classroom parties and Trunk-or-Treats to ghosts and goblins knocking on your door, Halloween puts snacking front and center. But for youngsters on restricted diets, the holiday’s focus on foods they can’t eat puts a big damper on trick-or-treat fun. One in 13 U.S. children has a food allergy. That’s about two kids per classroom. For many, just touching the wrong food causes hives and the smallest taste can be life-threatening. 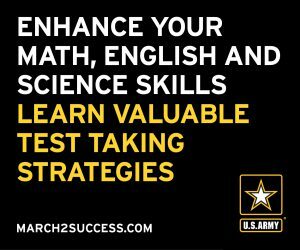 Other students have different health needs that require a special diet, including diabetes, celiac disease and many digestive disorders. Like every other child, these children deserve a fun, inclusive Halloween. Join the Teal Pumpkin Project to make Halloween happy and safe for all children—including those who can’t eat a chocolate or candy treat. Why teal? Teal is the color of food allergy awareness. 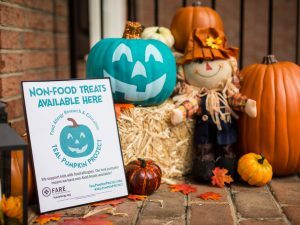 When you display a teal pumpkin (or a Teal Pumpkin Project sign), you’re letting kids and their families know that you have non-food goodies to share. You don’t need to choose between offering either snacks or trinkets, so long as the food and non-food treats are kept in separate bowls. Toys and prizes won’t go to waste, since they’re popular even with kids who love candy. 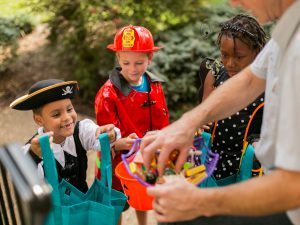 Some of these kid-friendly items are useful as well—such as glow sticks and glow jewelry that make trick-or-treaters easier to see at night or Halloween-themed pencils and erasers that come in handy as spare school supplies. Whether your pumpkin comes from a farm or a craft store, painting it teal combines creative play with a lesson in empathy. 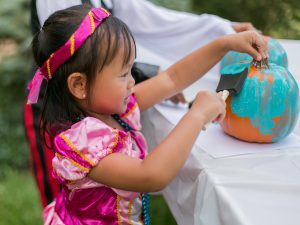 Decorating a teal pumpkin or coloring an activity sheet reminds kids that while some classmates may not be able to eat some candies, we can include them in the fun by offering treats that are safe for them. We can trick-or-treat others the way we would want to be treated. The 2016 goal of the Teal Pumpkin Project is for at least one home on every block to stock up on non-food treats and welcome all trick-or-treaters with a beautiful teal pumpkin. We hope this Halloween, children with food allergies and other restrictive diets will spot a teal pumpkin on your doorstep or in your school Halloween festivities, and smile. For more info—including links to free resources to help create a happier, safer Halloween for all—visit TealPumpkinProject.org. Lois A. Witkop is Chief Advancement Officer for Food Allergy Research & Education. She is proud mom to two teens and is a parent member of the Robinson Secondary School PTSA in Fairfax, Va.